Office Hours: Monday - Friday, 8:00a.m. to 4:15 p.m.
From West Main St., turn onto Thomaston Ave. There will be a Texaco and a Hess Gas Station at the intersection. Go down Thomaston Ave. for about a quarter of a mile. The office is located on the left just past Dunkin Donuts. Go in the driveway and drive around the building. The entrance is located on the right, driveway side, of the building. Enter at the white, blue and green canopy, that says American Job Center. Take Route 8 North to Exit 36, Huntingdon Ave. Take a right off the exit. At the second traffic light take a right onto Thomaston Ave. The office is located 1.7 miles down on the right, just before Dunkin Donuts. The entrance is located on the right, driveway side, of the building. Enter at the white, blue and green canopy, that says American Job Center. Take Route I-84 East to Route 8 North, Exit 20. Follow Route 8 North to Exit 36, Huntingdon Ave. Take a right off the exit on Huntingdon Ave. At the second traffic light, take a right onto Thomaston Ave. The office is located 1.7 miles down on the right, just before Dunkin Donuts. The entrance is located on the right, driveway side, of the building. Enter at the white, blue and green canopy, that says American Job Center. Take Route I-84 West to Route 8 North, Exit 20. Follow Route 8 North to Exit 36, Huntingdon Ave. Take a right off the exit on Huntingdon Ave. At the second traffic light, take a right onto Thomaston Ave. The office is located 1.7 miles down on the right, just before Dunkin Donuts. The entrance is located on the right, driveway side, of the building. Enter at the white, blue and green canopy, that says American Job Center. Take Route 8 South to Exit 36, Huntingdon/Colonial Aves. Take a left off the exit onto Colonial Ave. Take a left at the traffic light onto Huntingdon Ave. At the third traffic light, take a right onto Thomaston Ave. The office is located 1.7 miles down on the right, just before Dunkin Donuts. The entrance is located on the right, driveway side, of the building. 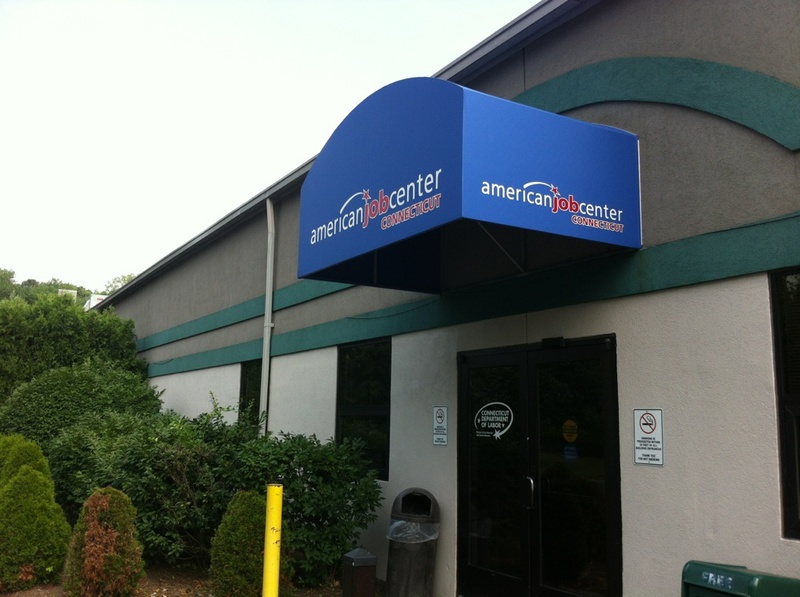 Enter at the white, blue and green canopy, that says American Job Center. Go in the Entrance driveway (one-way). Turn right to park at the front of the building. If no spaces are available, additional parking is provided at the sides and back of the building. Office Hours - Monday - Friday, 8:00 a.m. to 4:15 p.m.